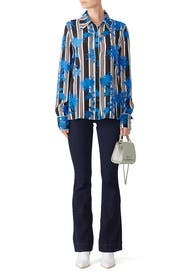 Abstract blooms stamp this striped silk Diane von Furstenberg dress cut in a loose, pajama-inspired silhouette. Pair it with the Sea Salt Eartha Crossbody by ZAC Zac Posen Handbags. Black and blue printed crepe (100% Silk). Top. Long sleeves. Shirt collar neckline. Exposed front button closure. 27" from shoulder to hemline. Imported. 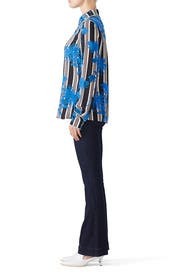 Abstract blooms stamp this striped silk Diane von Furstenberg dress cut in a loose, pajama-inspired silhouette. My typical size being a Small, I felt the 2 fit perfect. This top is ideal to dress up any outfit. I completed my look with jean shorts and silver mules. This shirt is amazing! The print, the cut , the details. Everything is perfect. I got it to wear to work but it seems very versatile, I think you could wear it just about anywhere. I think it runs true to size, or maybe a tad on the small side. I was planning to wear this for work, but I didn't end up doing it. I didn't end up wearing this because I walked out and my husband said "why are you wearing a shirt with palm trees?" Unfortunately, that ruined it for me. The shirt did fit true to size and I liked the way it hit my curves. The print is a little too '70s Vegas for me. Cute cut and quality fabric, but all I needed was a white blazer, gold chain, and aviators to pull off a solid Elvis costume. Pretty colors. Love the material. Can't go wrong! 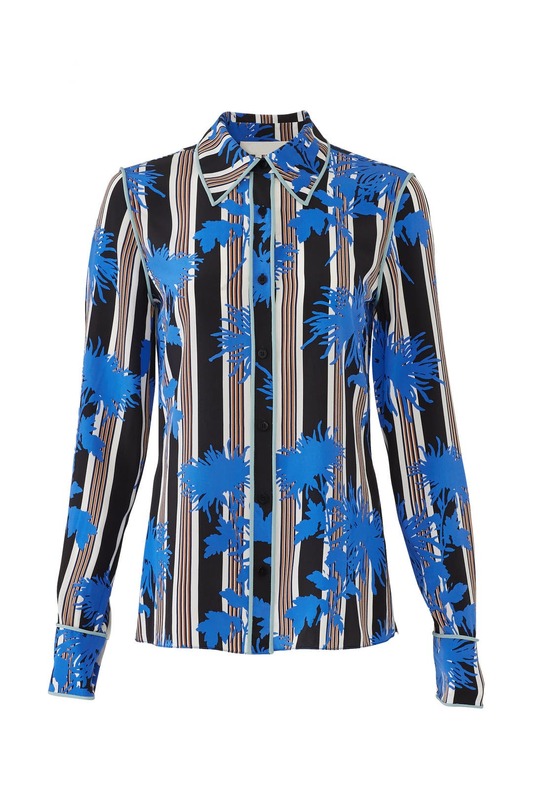 This blouse is THE BOMB super versatile. I wore it with a black vest and pencil skirt. Super Chic with gray, white, black and has caramel brown pinstripes. Runs small as Dvf often does. 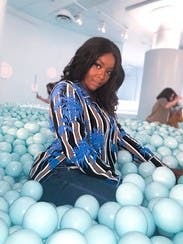 Love DVF...this fabric was so luxe and the pattern was super cool. I received tons of compliments. Wore it with a black pencil skirt and fun flats. 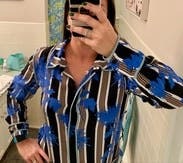 I would definitely rent this again and will look at other DVF blouses from now on! I'm shirt speaks for its self love love love! It's a great top for work and after work. I received lots of compliments- interesting print. Fits very true to size but did need to use fashion tape to keep the buttons from gapping. Bold print in great colors. Collar was a little flappy - more PJ top style than I expected. Paired w a fitters skirt for work day. Colorful florals and stripes spice up a suit or denim. Works w navy and black. Classic DVF styling. Fits TTS. I have wider shoulders so sometimes i have to get bigger tops if they are button up, but this fit true to size. I liked it for one time wear. More print than I normally wear. Loved that I could wear this with brown or black. I am a sucker for cobalt blue. The design did not disappoint. Can be worn tucked or not, but it is not very fitted. 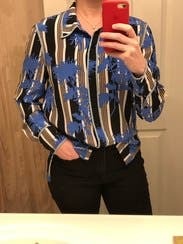 I really liked this shirt, but I'm not sure I styled it quite right. The fabric is a beautiful soft silk, and the combination of stripes and floral makes the print interesting and distinctive. I wore it with a suede skirt, but I don't think it worked quite right, which was more of a reflection on my skirt than this shirt. 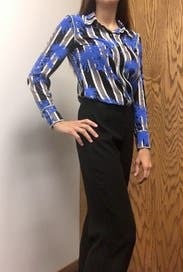 I would consider renting again to wear with a black pencil skirt or black pants as in the model image. Fit was good. Great versatile shirt. Many compliments. Tempted to buy. 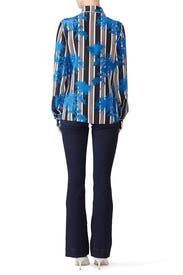 Beautiful blouse-Love DVF. Tons of compliments. Very happy! Highly recommend. Pros: Great fabric and pattern. Love the pipping detail. Cons: DVF tends to run small so I always have to size up. I am generally a size 10 in button up tops but took a size 14, which overall fit well. The sleeves where a bit long so I had to fold them. I probably could have taken a 12, but then it would have little snug in the shoulders. Beautiful rich colors and felt awesome! It was a little big but looked fine under jacket. Material and styling very well made. I loved it and felt good in it all day. Flattering button-down shirt. Periwinkle blue piping trim, which isn't super obvious from the model photo. This blouse is a much bolder style than I would typically wear, but that's the reason I joined RTR! I wore to work one day and received a couple of compliments. It has very interesting the pattern, and I wore with black slacks. Beautiful material and DVF quality. Absolutely would rent again, really enjoyed. Beautiful colors, material & fun print. The 8 fit well everywhere except for one button in the front. Larger chested ladies know what I mean. The 10 would have been too big overall. Looked great with black pants or jeans. My hubby called me "Lesure suit Larry" in this get up! Sometimes I get a little cray with my ordering. I guess since it's unlimited makes me take more chances. I actually think would be kinda cute tucked into a tight pencil skirt but did not like it untucked at all. I am a true 4 and felt too big to me. 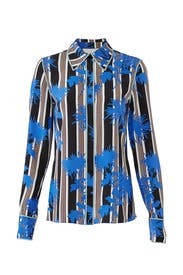 Great artsy blouse for work. Nicely made, striking. 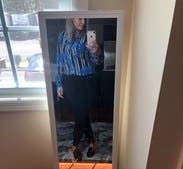 This blouse makes the outfit on its own! Gorgeous. It's just a great blouse. For anything really. I wore it to work and then to a shopping event. I received so many compliments. The pattern was so vibrant, I stood out! Amazing fit and look! Goes with EVERYTHING! With silky fabrics, the arms can be tight and uncomfortable. Not this top! Fit sooooo nicely, flowy without being a fat lady shirt, and the overall pattern was complimentary and fun instead of muddled and excessive! I wore it with jeans and boots, but a skirt, slacks, a suite... the options are endless! Sorry I didn't get a picture. I looked so bomb! Fit is great, looks wonderful with jeans and skirts! Loved wearing it to work. A lovely pattern but a big snug through the bust. It just works. Simple elegance and edgy details at the same time. As previously mentioned, does have thin light blue piping which is not evident in photos. Although not thrilled with that upon opening, really liked how it offset the blouse. My husband is typically not a fan of loud patterns but loved this one. It does gap at the buttons if you have a large chest so I wore a cami underneath. It gaped open a bit. I wore it buttoned up with a jacket, then later unbuttoned a few to wear by itself. Both looks were very cute. The sleeves were nice and long for this tall girl. There are slits in the sides which make it look nice to wear untucked even if you've got hips. Blue/stripe design stood out in a good way; wasn't too loud. 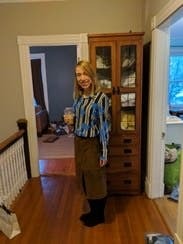 Blouse is very versatile and I dressed it up and down. The straight across hem makes it easy to wear untucked with pants but I also wore it under a black dress for work. The print does a nice job of hiding wrinkles. Received a lot of compliments. Surprisingly flattering for a loose blouse. Got lots of compliments! This is my second time renting this shirt. It is a unique pattern that goes great with a blazer and jeans. It has a standard fit and great colors. You won't regret renting this one.